Would you believe that office cubicles and commercial office furniture can be an investment and that you can have an ROI on the furniture you buy? Office furniture can impact your brand, recruiting and sales. 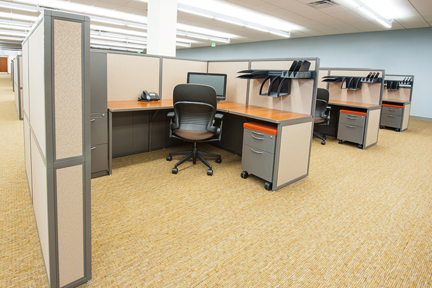 Your office furniture can dramatically affect employee productivity. On the first point, consider how potential customers and employees will view your company when they come to your office. If you have low quality furniture that doesn’t maximize the value of your brand image these individuals may be less inclined to have a positive impression of your company. Next, realize that some inflexible pre-fabricated office cubicles may cause you to lose valuable floor space and burden you with a recurring cost in lost workspace month after month. Finally, furniture that is not designed and manufactured to be ergonomically friendly can reduce employee productivity and again can cost you money month after month. Poor ergonomics can also increase your healthcare costs. This is why at Interior Concepts we strongly believe that your office furniture should be viewed as an investment. We know our furniture enhances sales and recruiting because that has been our customer’s experience. When it comes to maximizing space and employee productivity our furniture is custom designed and manufactured to use your office space efficiently and provide employees with an ergonomic work environment that improves their productivity. At Interior Concepts we say we provide “the best furniture purchase experience in the industry” that’s because our process will help you from beginning to end. Our Process starts with our ImagineIT! Online Design Session that ensures you get exactly what you need to maximize the use of office space and achieve a look that matches your brand. You will see a 3D rendering of what your new furniture will look like once it’s installed. Interior Concepts quality is superior and you get a lifetime warranty. Our office furniture is designed and manufactured to look good for years. The final element that will give you the best furniture buying experience in the industry is the installation. We do the installation for you so that it’s perfect. If you would like to avoid mistakes on your next office cubicles investment purchase you can contact Interior Concepts and experience our ImagineIT! Design Session. It’s a free no obligation service and one of many reasons we provide the best furniture buying experience in the industry. If you’re looking for more information download our free report, 5 Tips to Ensure ROI When Buying New Furniture. Or if you have a project and would like to get started give us a call (800) 678-5550.